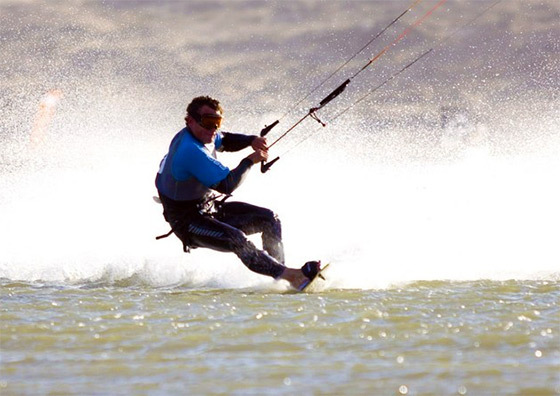 The Luderitz speed trials lived up to expectations late October and it is now official – kitesurfers are the fastest thing under sail – a kite is technically a type of sail. Rob Douglas from the US pipped Frenchman Sebastien Cattelan to the post with a top speed of 55.65 knots as against Cattelan’s 55.49. Alex Caizergues achieved a respectable 54.93. 6 other kiters crossed the 50 knot mark. In epic winds of 45 knots Douglas smashed all previous speed sailing records – including L’Hydroptères’ with his amazing 55.65 knots (kitehigher) over a distance of 500m. L’Hydroptère’s top speed to date is 51.36 knots. Douglas also smashed his wrist at the end of the run. It’s been fixed and he now has a nice titanium one! But it is fitting that it was Douglas who became the new king of speed sailing as he was the man who brought kite-boarding into the speed sailing arena in 2008 where he achieved a remarkable speed of almost 50 knots – since then technology has given the sport a boost. The Luderitz Speed Trials are held on a 4 metre wide, 18 cm deep ditch. Absolute confidence in yourself and your equipment is vital when you are reaching speeds of around 65 mph (104.6 km). All sorts of records were made at this years’ speed challenge. Sebastien Cattelan from France is the new French and European record holder with 55.49. Charlotte Consorti, France, got 48.5 knots on the display, followed 30 minutes later by Sophie Routaboul, also from France, with 48.64 speed. Shortly afterwards Charlotte returned with a 50.43. She is the first woman to pass the 50 knot barrier. Basil Cambanis established the new South African record with 50.75 knots and to local Namibians’ delight, homegrown boy, Stefan Metzger, achieved 48.57 knots. A new Solvinian record was also set by Jernej Privsek with 46.60 knots.